Datura Road sits at the crossroads of various musical styles that are finding new life in the Hudson Valley and greater New York area. By bringing together elements of the east and west the band creates a new type of world music that emphasizes song-form and groove, introducing new textures to the western ear. 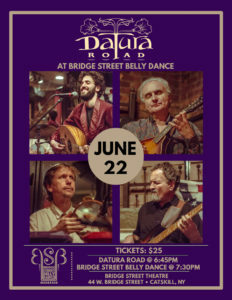 Their debut release, Datura Road, features instruments such as the ud/oud, doumbek, bansuri, and tabla, in addition to the more familiar guitar, bass, and drum framework. Besides unique instrumentation, the roughly thirty-year age gap between front man Matt Nobile (twenty-six) and the other three touring members will surprise most audiences. This accounts for the even wider age range among their listeners and likens the band more to jazz and world music contemporaries than it does to more mainstream up and coming artists. The band formed when Matt Nobile invited guitarist/mandolinist, and former teacher Raphael Garritano, to work through some songs that Matt had been stockpiling. Percussionist David Budd, who had played with both Matt and Raphael in the local Latin group, Passero, was recruited shortly thereafter, and bassist Peter Nobile was pulled into the studio by his son Matt to finish the album project and quickly became the permanent fourth member. All four members are influenced by artists such as The Beatles, King Crimson, Bob Dylan, and Ravi Shankar, but also bring flavors of their own into the music. Raphael has been a lifelong listener of western classical and medieval music, David of West African and Middle Eastern music. Peter has consistently performed in jazz ensembles and in musical theater, and Matt holds a B.S in Jazz Performance from SUNY New Paltz and studies Arabic classical music. The various styles of music that come together in Datura Road expose listeners to what happens when stylistic conventions are pulled apart and recombined. The Gerudo are known to be a reclusive tribe; this branch is anything but! The Gerudo Vagrants are a dangerously fun fusion duo comprised of two best friends – Andriel and Jessi. Andriel is a certified ATS (American Tribal Style) teacher, and proud FCBD (FatChanceBellyDance) Sister Studio. Jessi has roots in Lyrical, Jazz, and American Cabaret, but quickly spread out into fusion performance. With these backgrounds both members smooshed together their knowledge and experiences to create their own spell-binding rhythm. The Vagrants make appearances along the East Coast. Their presence has been requested for performances and workshops at conventions such as “AVGC” in Secaucus, NJ and Escape Velocity in National Harbor, Maryland. Later this July they will be presenting a new piece in the “Faces of Music: Greatest Artists of All Time” event in Dunellen, NJ. Together, Andriel and Jessi have teamed up to bring a bit of nerdiness to whatever stage they appear on, and they are ready to take on the final boss. The Lunachix have been crafting their unconventional brand of modern fusion dance since 2013. Winner of the 2017 East Coast Classic troupe competition, the Lunachix count Jill Parker and Amy Sigil among their biggest inspirations. Directed by Jo Boring, the Lunachix perform both original choreographies as well as Hot Pot/ Unmata style ITS. The Lunas reside all over central New York, and are bonded by dance, friendship, and the light of the moon. Inga is a passionate dancer from Hannover, Germany currently living in Ottawa, Canada. She fell in love with Tribal Fusion Bellydance at a young age but soon gained experience through national and international performances. Going through school for gymnastic teachers Inga did not only learn more about dance but also about fitness and anatomy and applies this knowledge to her classes and workshops. She has been part of several collaborations such as Deb Rubin’s ‘Project Merkaba’, Alexis Southall’s ‘Juniper Collective’ and the trio ‘Soul Collective’ with Cristina Zegarra and Sway Efey. Born on a mountaintop under the summer solstice sunrise of 2013, Cult of Yes is a little bit witchcraft and a lotta weirdo. 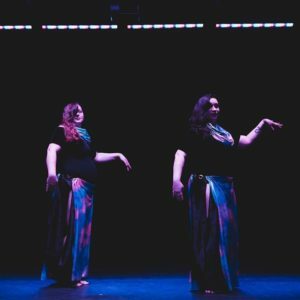 Sharing a love for adventure and really great music, the unorthodox bellydance duo now travels near and far from their Montreal home, bringing unusual dances and searching for fresh movement, good times and kindred spirits. Cult of Yes believes in collaboration and have worked with Heather Labonté, Inga Petermann, Kali Maat, and Florence Leclerc’s Grace & Beauty Ensemble, to name a few. They are also members of ITS Alive!, a Montreal-based improv troupe, as well as the larger Beast Coast ITS community. They love dancing to live music and have performed with bands ranging from the joyful eastern European folk explosion of the Lemon Bucket Orkestra to the ancient world music of Ensemble Skarazula, all the way to the rock and roll spectacle of White Cowbell Oklahoma. Cult of Yes have taught and performed in Canada, the U.S., and Europe, and are mainstays at Tribal Momentum in Montreal, a festival they have helped run since its inception in 2017. Rose Calavera is a modern fusion dancer hailing from the wilds of Upstate NY. 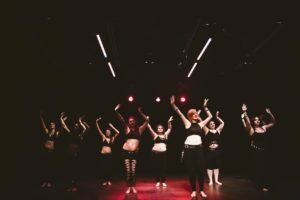 After 15+ years performing traditional Irish step dance semi-professionally, she took a bellydance class on a whim and fell completely in love. 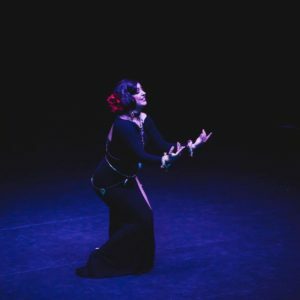 She has gone on to be proficient in multiple disciplines, but her heart was captured by the aesthetic, duality, and expressive nature of fusion bellydance. As well as performing solo, Rose is a proud member of the Lunachix, a student Hot Pot ITS, and one half of the Moonshine Two with her “dance wife” Jo Boring. She’s delighted to be joining Bridge Street Bellydance once again! Francesca uses movement and dance to connect, to share her story with audiences, and to celebrate what it means to be human to her. Francesca found belly dance in 2005, and took Cabaret and Turkish style classes for two years. In 2012, she graduated with her Masters of Education. Shortly after graduating, she came across Tribal Fusion Belly Dance. That was when her life changed. Francesca studied with Rachel Brice from 2013 until 2016 and is an 8 Elements™ Certified Practitioner. While she travels around the US to perform, collaborate, and to train with renowned dancers, she resides in Catskill, New York. Francesca is the producer of Bridge Street Belly Dance and has been working closely with photographer and videographer, JD Urban, on a collaborative docu-series: “Why I Dance”. Francesca is also currently studying and working with the captivating, multi-faceted Mira Betz. Francesca is dedicated to growing and evolving through this art form that is fusion belly dance. When New York-based fusion belly dance performer Danielle Hutton moves, it’s sensuality incarnate. It’s a concentrated slow burn of sincerity and elegant emotionality. Authenticity and nuanced grace imbue all of Danielle’s work: in her dancing, both her solo and collaborative work, as a choreographer, creator, and consultant, and as an educator, teaching privately, instructing classes, and conducting transformative workshops. 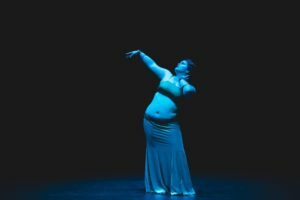 For over 17 years, Danielle has been a fixture within the New York City belly dance community. She was principal dancer in Solstice Dance Ensemble from 2008-2010. During her tenure with the collective, she performed at such distinguished events as Tribal Fest, The Massive Spectacular, Rakkasah East, and Spring Caravan. In addition to these collaborations, she’s had the honor of performing with Zilla Dance Ensemble, Bellyqueen, and Solstice Tribe. Danielle is the director and producer of Choreographer’s Vision, a theatrical fusion dance salon that promotes the exploration of human connection through movement. Brand-spaking-new to Massachusetts by way of San Francisco, introducing Yvonne Michelle! Ten years of middle jiggling, shape making, rounded silhouettes and noodling to music leads us to tonight’s adventure: a blending of flamenco and bellydance! Join me tonight in exploring how one art form seamlessly stitches into another. ITS Alive! 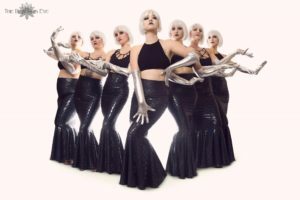 is an eight-armed dance monster from Montreal, composed of Marina D. Ray, Lisa Champagne, Dominique Senécal, and Sue Snyder. ITS Alive! Have been practicing and performing Hot Pot ITS (Improvised Tribal Style a la Unmata) together since 2014. They are known for their precise and energetic performances, as well as their ability to throw great parties. They are half of the team that puts together Tribal Momentum, an annual summer dance festival held in Montreal. ITS Alive! believe that group improvisation is in its own way a kind of shared mindfulness practice where one must surrender to the moment. They are fond of vintage monster movies, bawdy jokes, and building spaces for community to gather. Serena Spears is an internationally renowned and award-winning fusion dance performer, teacher, and choreographer from Brooklyn, NY. 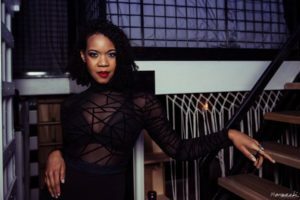 As a solo artist and choreographer, she integrates decades of training in hip-hop, modern, African, ballet, and Latin dance forms with bellydance. Known for her boundless energy, athleticism, precise technique, and commanding stage presence, Serena focuses on creating exciting, seamless fusion that fascinates audiences around the world. 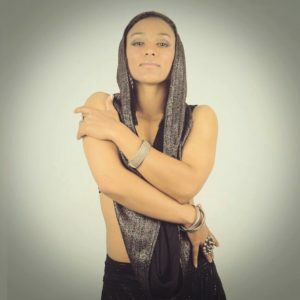 In addition to her solo work, she has performed across the country as a principal dancer of Solstice Tribe, directed by Sera Solstice, as a satellite member of Sepiatonic, based out of Portland, OR, and in recent collaborative projects with fusion dancers and choreographers including Ebony Qualls, Sharon Kihara, Rin Ajna, and Sekou McMiller. In addition to her six years of deep training and collaboration with Sera Solstice, Serena has studied intensively under the leading ladies of fusion bellydance including Suhaila Salimpour, Rachel Brice, Zoe Jakes, Donna Mejia, Mira Betz, Sharon Kihara, and Jill Parker. Serena completed Rachel Brice’s 8 Elements: Initiation in 2013 and attained her Suhaila and Jamila Level 1 Certifications in 2013 and 2014, respectively. Serena continues to expand her movement studies outside of bellydance with regular classes and intensives in ballet, Afro-Latin, modern, hip-hop, salsa, tango, poi, and aerial arts. Beast Coast ITS is a dynamic dance troupe featuring Hot Pot Improvisational Tribal Style (ITS) dancers from across the East Coast of the USA.